Cong Lu, Yuanlei Huang, Glenn Pham and John Pham work on Changuya’s Moon Festival, which won for Best Art Game at the SJSU x NeuroSky Hackathon (photo courtesy of G. Craig Hobbs). You use your brain to play video games. But did you know you could be using your brain waves? At the recent SJSU x NeuroSky Hackathon, art, computer science, engineering and animation majors designed the very best video games they could in 24 hours, with a NeuroSky headset being the primary controller. 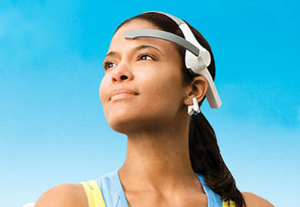 A NeuroSky publicity photo shows the headset with sensor touching the model’s forehead. “The hackathon provides access and opportunities for students to experiment with emerging technologies, while encouraging innovation, entrepreneurship and interdisciplinary interaction in a fun, creative, and challenging environment,” said G. Craig Hobbs, assistant professor of digital media art. 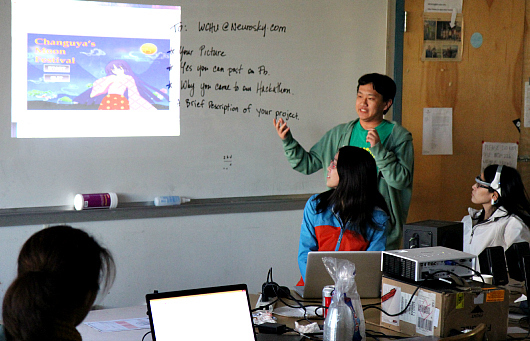 A developer from San Jose-based NeuroSky helped run a boot camp for hackathon participants. The headset digitizes electrical brainwaves (more commonly known as EEGs) to control games. What this boils down to is “writing programs that translate user brain activity into commands, pictures and sounds,” said Jon Pearce, chair of the Department of Computer Science. 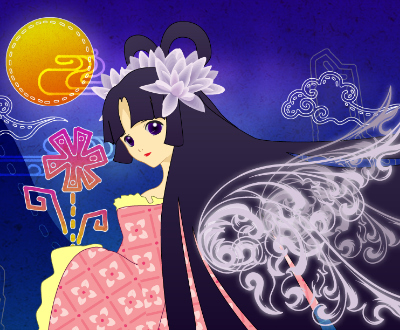 The player manipulates the game by concentrating, relaxing or balancing the two to reach a “zen” state. Applications include games for children who need help learning to focus their thinking. A screen shot from the overall winning project, Immunity (image courtesy of Tamara Chang). The overall winning project was Immunity by the team “Pew Pew Studios,” comprised of Arthur Baney, Will Pham, Rocky Oliver and Tamara Chang. 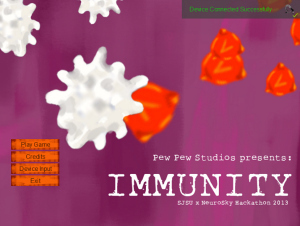 “In our game, you are the immune system of a sickly body,” Chang said. “When the player is relaxing and concentrating, the white blood cells in the body begin to take over the red viruses. “However, if the player becomes worried or distracted, the red viruses multiply and kill the white blood cells. Hobbs is director of the Learning and Games Consortium, an interdisciplinary group promoting educational games. Check out student work on the Game Development Club website.